The 3-day Ayers Rock experience awaits you in the middle of the 5th continent and other exciting encounters. Ayers Rock, known as Uluru by the Aborigenes, is undoubtedly the most famous mountain in Australia. The Uluru is the sacred mountain of Anangus, an Aboriginal clan from central Australia. 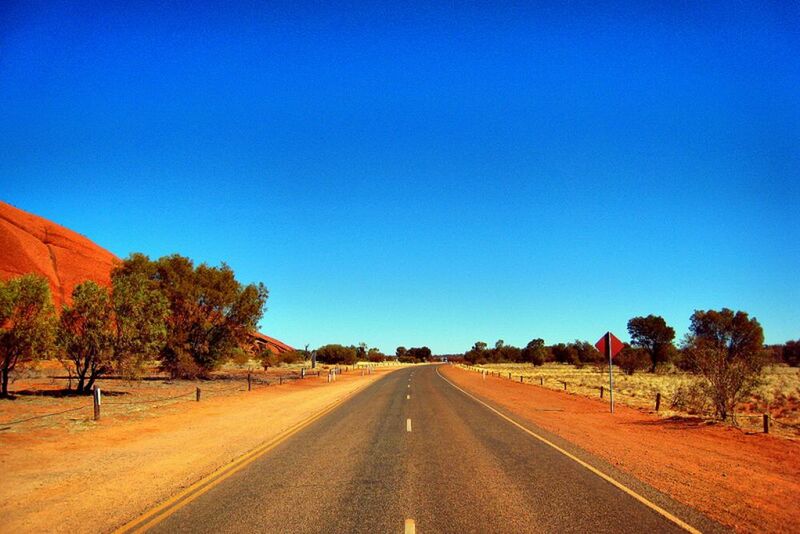 The trip to the foot of the Uluru is an experience worth having in itself. The Sound of Silence Dinner transports you into a dreamworld in the Outback. 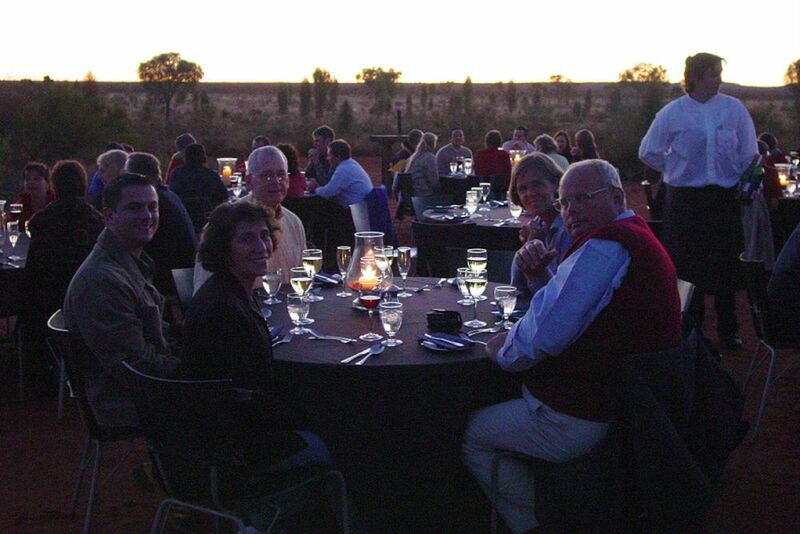 On Day 1, experience the Sound of Silence dinner under the stars of the Outback. Make yourself comfortable at a campfire. 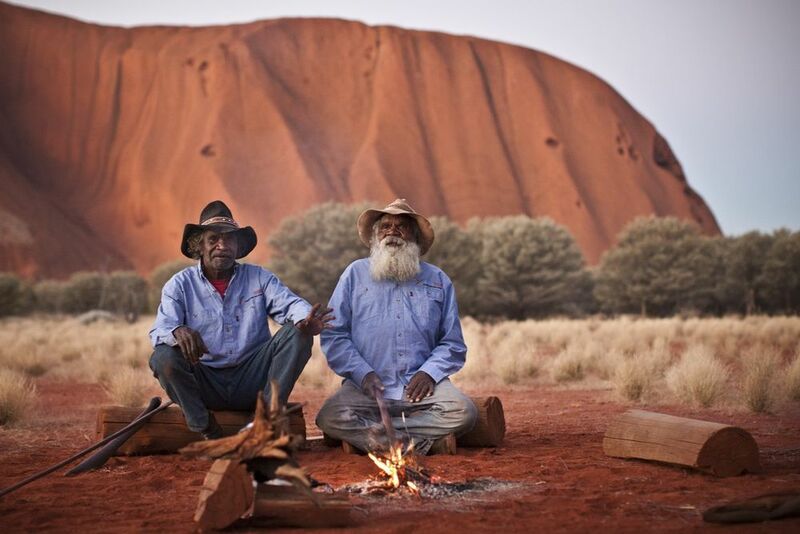 The Olgas are scheduled for Day 2. You can walk between the conical rock formations. The Anagu, the local Aboriginal tribe, worship the Uluru as sacred. Your accommodation is the Desert Gardens Hotel. This trip is customizable to fit your needs. 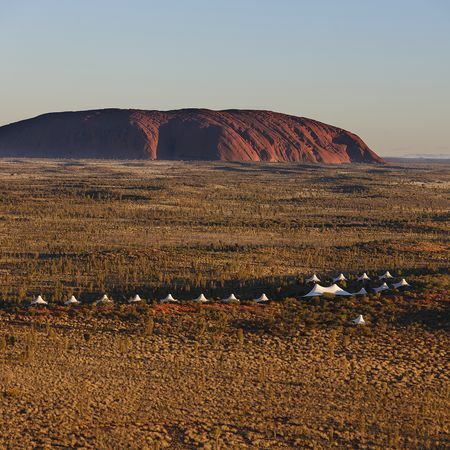 Like an island, the Uluru stands out from the outback. The Australians call their most famous mountain, Ayers Rock, the "Red Heart" of the country, for it defines the approximate geographical center of the 5th continent. 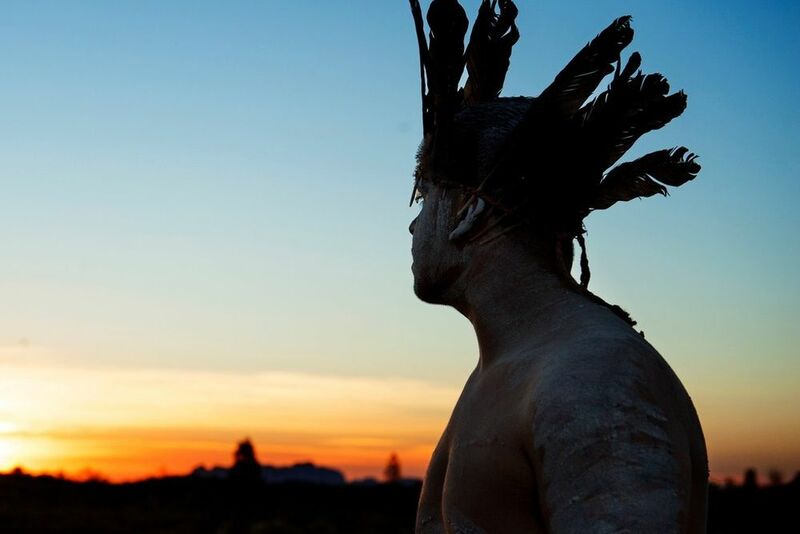 Join us on a magical 3-day Red Center tour, an experience that everyone in Australia should have. Upon arrival at Ayers Rock, head to the bus station. There you will find all the necessary information about your transfer to the hotel. Without a doubt, the Uluru, as it is called by the Aborigines, is the most famous mountain in Australia and one of its icons. Approximately 450 km from Alice Springs lies this legendary monolith formation, which incidentally is the second largest in the world. The estimated 550-million-year-old mountain covers a length of about 3 km and a width of up to 2 km. In the midst of the Kata Tjuta National Park, it stands majestic and mysterious with 348 of height. For the Aborigines, the Uluru is considered sacred because, according to their beliefs, it is in connected to the dream world. 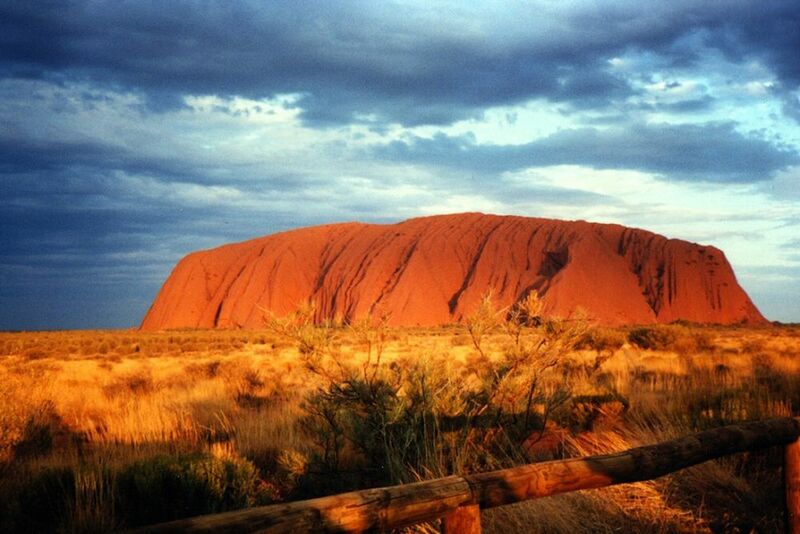 The name “Ayers Rock” comes from former Australian Prime Minister Henry Ayers. The English-Australian explorer, William Gosse, gave it its name after its discovery in 1873. 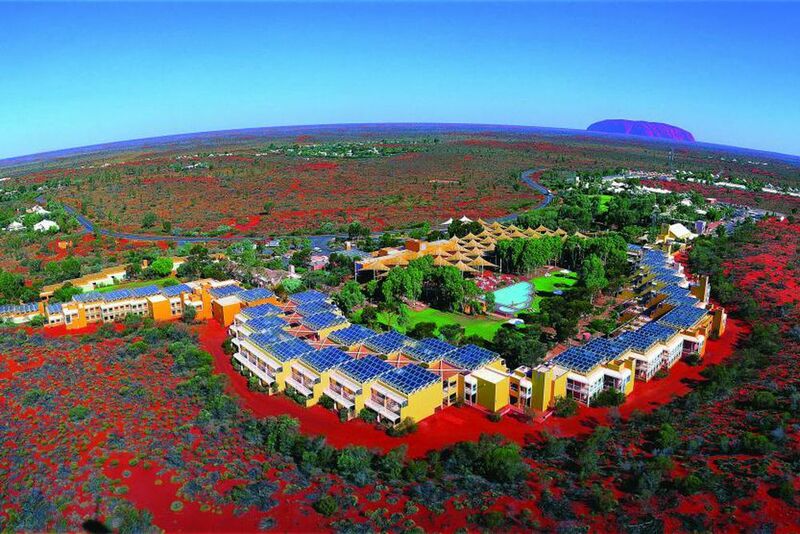 No one would want to miss the wonderful sight of Ayers Rock changing colors at sunrise and sunset. Due to the changing light on the iron oxidants of the mountain, different shades of red pop before the spectator. The most popular activity at Ayers Rock is hiking. Choose between guided hikes or hiking tours on your own, and explore rock paintings of the indigenous people who have been living there for over 10,000 years. Please note that you cannot climb the Uluru. This prohibition is clearly stated on warning signs "Do not climb the Uluru". Uluru itself offers many activities, such as dance workshops, making small art objects, boomerang games, watching the Wakagetti dancers and much more. Please note that the availability of free time activities may change due to the season and weather. Today you will wake up early and drive to the Talinguru Nyakunytjaku Uluru viewing area, from where you will have the best view of the sunrise over the fabulous red mountain. 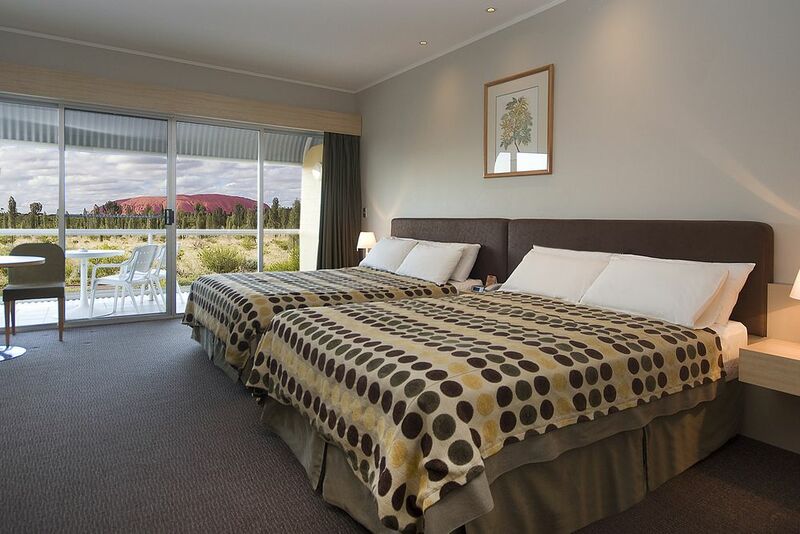 Enjoy the first rays of sunshine that fall on the Uluru and dip it in soft reds with a morning coffee or tea. 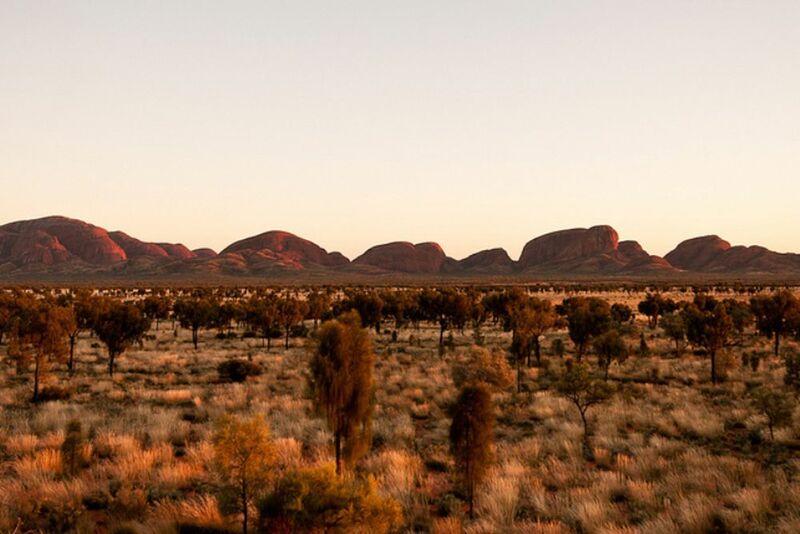 Then drive to the domed 36 mountains of Kata Tjuta, also called the Olgas. 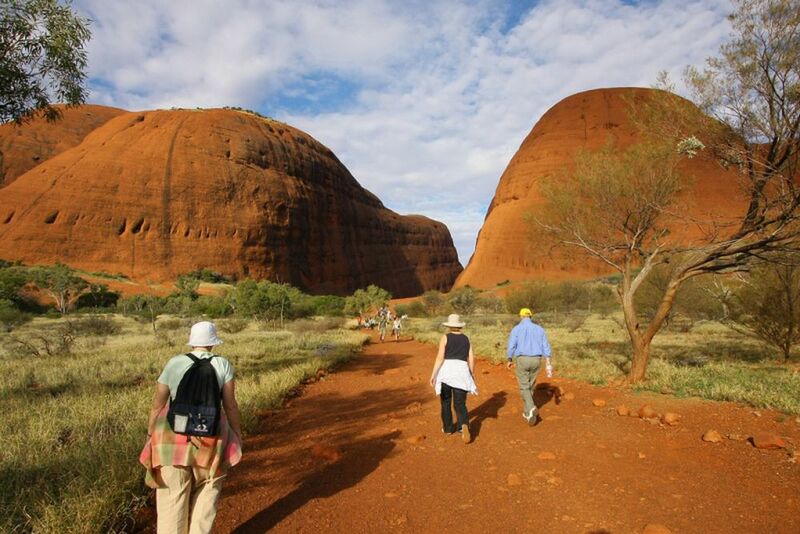 On the way, you can enjoy wonderful views of the southern part of Kata Tjuta. Translated, Kata Tjuta means "many heads". When you look at it, you realize that the name is not far-fetched. Just like the Ayers Rock, the Olgas originated around 550 million years ago. Afterwards, you will stop at Walpa Gorge and explore the spectacular gorges and beautiful valleys. In the afternoon, we will tour around the Uluru. The bus will take you to Mutitjulu Walk and on to Mutitjulu Waterhole. Here you can see millennia-old petroglyphs of the Aborigines. 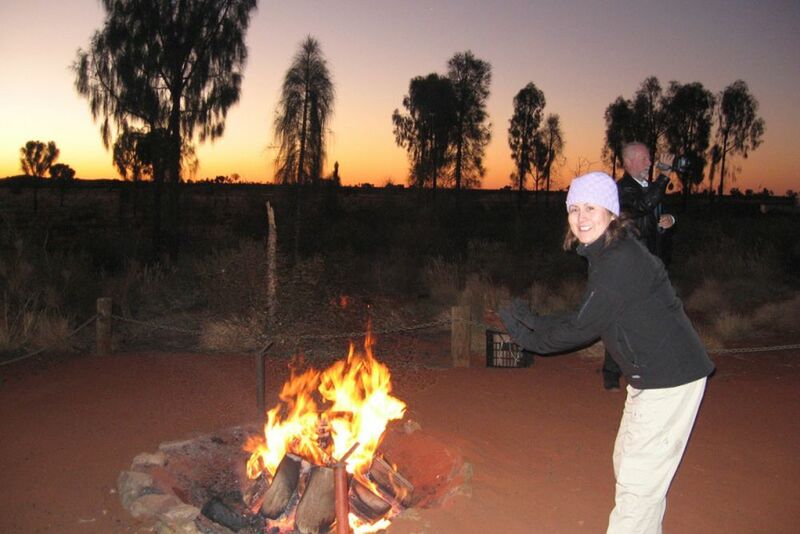 Your guide will tell you interesting facts about the local flora and learn interesting facts about the history of Uluru. 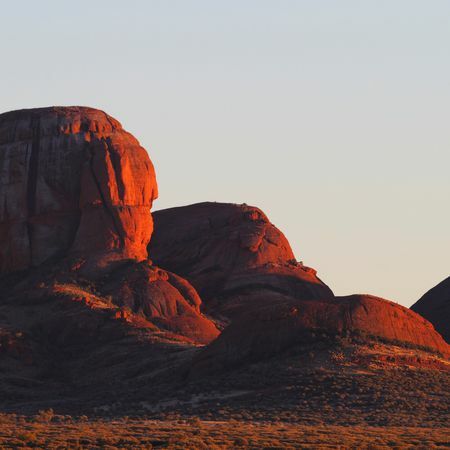 Also, visit the Kata Tjuta Cultural Center, where you can learn more about Aboriginal culture, its arts and crafts. You will drive back to the Uluru viewpoint in the late afternoon, where you can watch the setting sun dip Ayers Rock into rich reds. Do not forget to capture the spectacular moments with your camera. To make it perfect, enjoy a full-bodied glass of wine. 3. Tag: Ayers Rock – See ya! 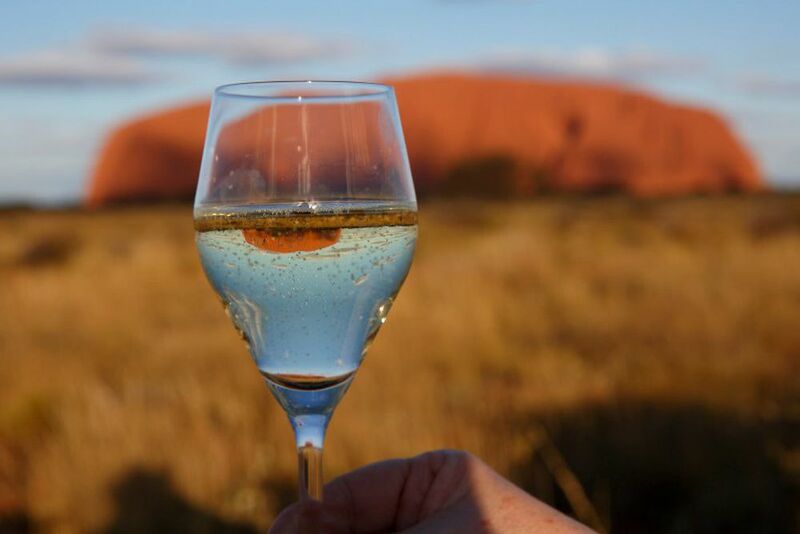 Today is the last day of your Uluru experience. Later we will head back to the airport, where you can continue your journey or fly back to your homeland. We hope you will come back soon. itravel - for that moment. Personal expenses such as gratuities etc. Return transfer takes place approximately 2 hours before departure .